What is Lean and Six Sigma? What is a Kaizen Event? Want to be a Green Belt? 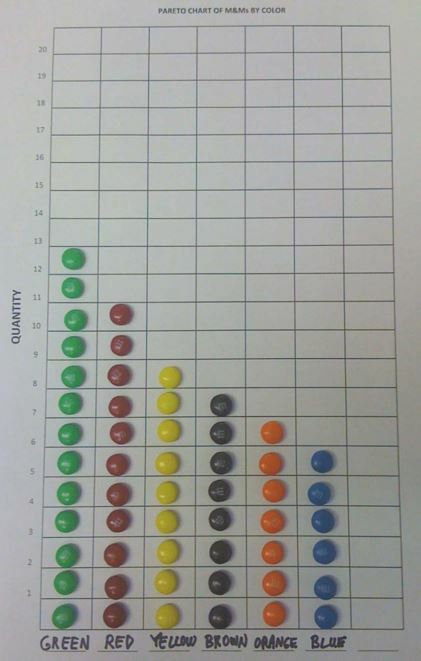 During our Yellow Belt (beginner Six Sigma) class, we have found lots of success teach statistical concepts using candy. It is a fun way to make statistics less “scary” for those who don’t have a strong math background. We start out the class by opening up the bags, and counting out the number of pieces in each bag. Each student separates the pieces into colors, and creates a Pareto chart of their bag (see image below). Next, we inspect the pieces to see how many have defects, so we can calculate a sigma level based on defect rates. Next, we collect the total number of pieces by bag from each student, and calculate a mean (average), median and estimate variation using the standard deviation for the number of pieces per bag. Yes, we calculate it all by hand, not using Excel or Minitab. In the next exercise, we create a histogram of the pieces, to look at the distribution of the class data (it comes out looking like a normal distribution, no surprise there). We calculate capability indices (Pp and Ppk) from the data, using specification limits that might represent wasted money for the company, or customer dissatisfaction from insufficient pieces in a bag. During some of our classes, we conduct a gage R&R study by measuring the size of candy pieces, to see how well we can get consistent measurements. Other times, we opt to use an attribute gage R&R study, and check to see how well people can determine the difference between different types of soda or brands of bottled water). Finally, we calculate control limits for an Individuals chart, and plot the results to look for “out of control” conditions (based on Nelson Rules, an updated version of the Western Electric Rules). If Six Sigma is new to you, this is the best class to get started. If you are already trained or certified in Six Sigma, you should also attend, so you can see how to take this fun class back to your company to teach your employees or clients. If you know someone who might be interested in this course, please forward this webpage to them. ← Which lean event type should I do first, Value Stream Mapping or Kaizen Burst? Download the DIGITAL version. This book is being released chapter by chapter, highlighting individuals who have helped nonprofits make improvements. Two chapters have been completed. We became a Certified B Corporation on 1/12/18. Read more about it on our press release or check out our scores! Nothing from April 21, 2019 to April 20, 2020. Save 5% at 6sigma.US with coupon code "BPI"
Over 200 scheduled classes to choose from. Save 5% with coupon code "BPI"
Enter your email address to get notified right away of new reference material, upcoming classes, new training material, recent articles, or new products we offer. What do I do with extra resources as a result of improvement without laying them off? Our Placekicker Is Out of Control! Enter code "BPI" to save 10% on your order! Copyright © 2019 Business Performance Improvement (BPI). All rights reserved.